Stephens is right, genetic screening around the world has been responsible for a major increase in terminated pregnancies when the fetus is diagnosed with Down syndrome. Iceland has had mandatory genetic counseling for all pregnant women since the early 2000s. 85% of Icelandic women choose to go through the testing resulting in a 100% abortion rate for fetuses diagnosed with Down syndrome. Denmark’s Down syndrome abortion rate is 98% followed by England at 90% and France at 77%. At this rate, Denmark is predicted to be “Down syndrome free by 2030.” However it doesn’t mean that women will no longer have a Down syndrome pregnancy, no solution or treatment has been found. It just means the society at large will be fully conditioned to believe that these babies lives are not worth living. People with Down syndrome may hold the key to curing or even preventing Alzheimer’s disease. The two conditions are genetically linked. People with Down syndrome have an increased risk for developing Alzheimer’s. They have a 25% chance of getting the disease once they reach 40 and that number jumps to 50% once they reach 60 years of age. That is a considerable difference from the overall population which only has a 6% rate for those over 60. Funding Down syndrome research will benefit families all over the world that have to watch helplessly as their loved ones slowly disappear into the fog of Alzheimer’s. Referring to the Down syndrome community as “the canary in the eugenics coal mine,” Stephens is asking how far will this go? Who’s next? 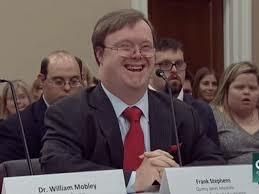 Once the world eradicates all people with Down syndrome, genomic research will just move to the next group that is perceived as imperfect and unworthy of life. It won’t stop. Thanks to socialized medicine, there is a financial incentive for eliminating any expensive medical or even personality shortcomings before the child is born. Now is the time for our society to take a stand and really think about the value of human life – all life.